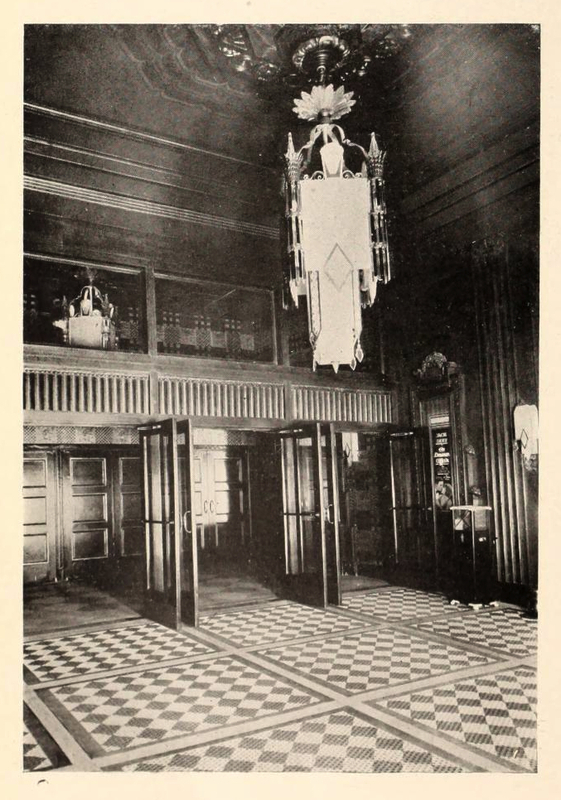 The lobby of the Madison Theatre, as seen in "Motion Picture News," July 6, 1929. Out of all of the theaters built in an era of grand and glamorous movie palaces, the Madison is one of the last where you can still catch a flick. The Madison was one of the first theaters in the nation that was designed and built to show that marvelous new sensation of the 1920s -- talking pictures. The Madison, ca. 1929 or 1930. Credit: oscars.org. 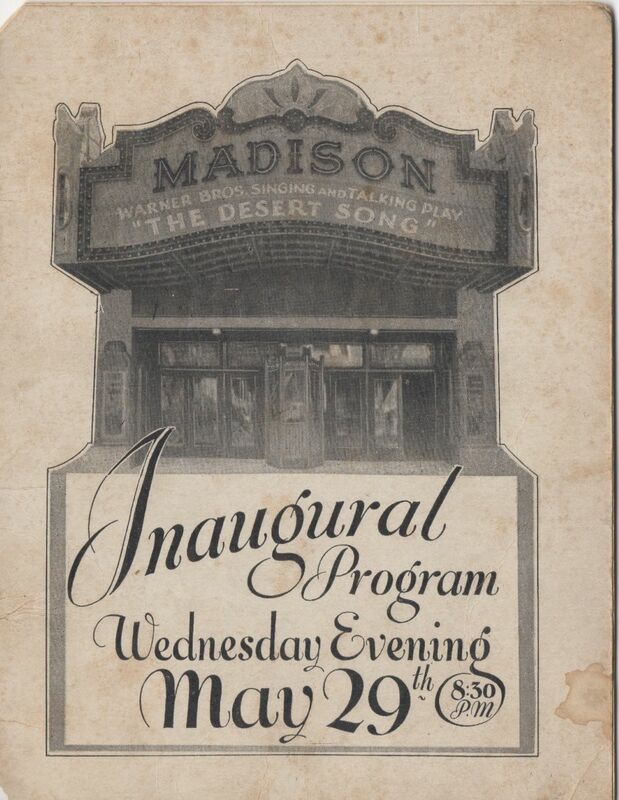 The program from the Madison's opening night, May 29, 1929. 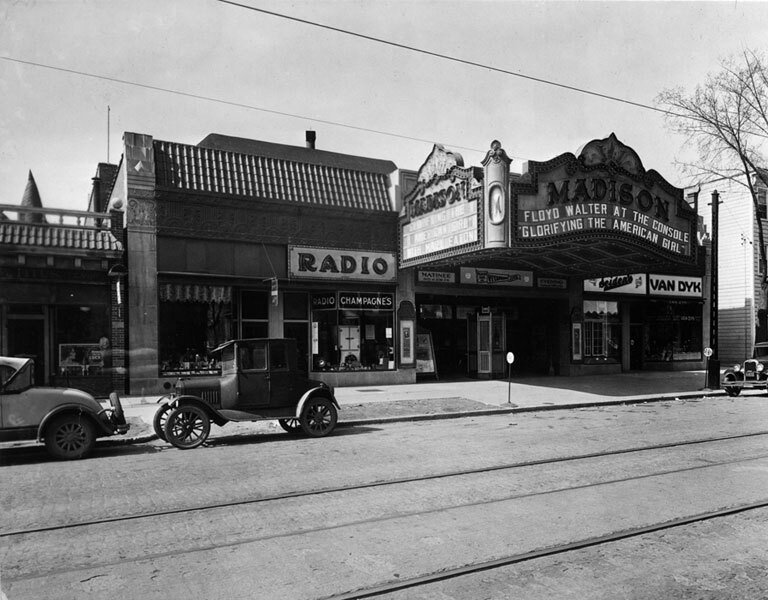 The Madison opened on May 29, 1929, with a gala attended by Mayor John Boyd Thacher II, neighborhood association president Judge James Nolan, a host of theater executives and other dignitaries. 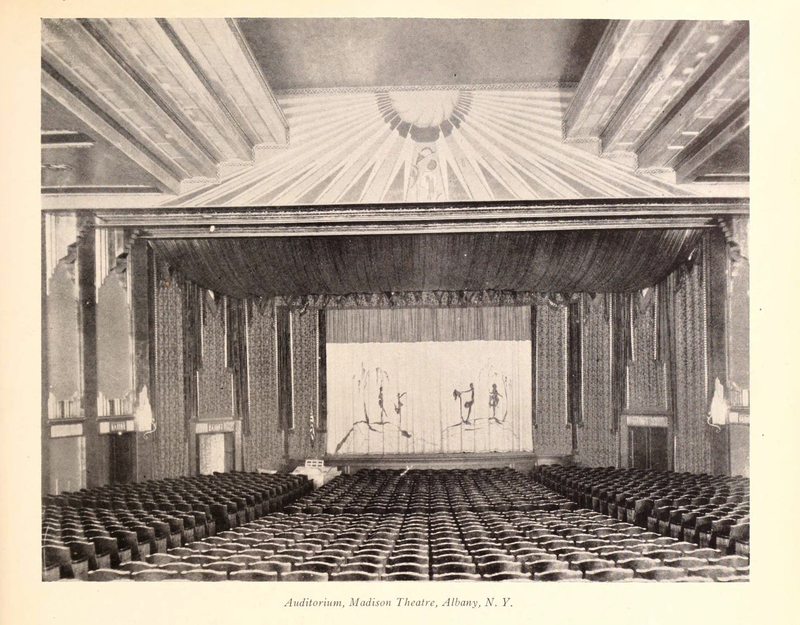 From time to time, it has been reported that Al Jolson, star of the early talkies, was at the Madison Theatre in person to act as master of ceremonies that night, but the opening night program indicates that he performed his emcee duties by way of “a special Vitaphone dedication film.” Sorry, Albany – but the sound equipment, after all, was the real star. Even without The World's Greatest Entertainer, no doubt there was plenty to enjoy at what newspaper ads promised would be “the most brilliant event in the annals of Albany” – including the feature film “The Desert Song,” a Mickey Mouse cartoon, and a musical performance of a piece called “At The Madison” played on the Wurlitzer organ. In the mid-20th century, the Madison belonged to every kid in the neighborhood. Public school and Vincentian, Manning Boulevard mansion and Partridge Street flat -- they all met on Saturdays in the velvet hall. A couple of coins would get you a double feature, plus cartoons and a serial. Blown your allowance already? Join the group in the alleyway: One kid would pay admission, and he'd open the fire door to let 10 more rush in. Then there was the night in 1952 when a kid brought his older brother's gun with him to the Madison to show his friends. In the middle of Doris Day's "I'll See You in My Dreams," the gun went off, and the bullet went through the seat in front of him. Fourteen-year-old Theodore Wendell, a freshman at Albany Academy, was the kid sitting in that seat. The bullet pierced his left lung. Things looked dicey for him for a time, but he made it, and while in the hospital he received a telegram from a sympathetic Eddie Waitkus, first baseman for the Philadelphia Phillies. Eddie had been shot in the chest by a crazed fan in 1949, but fought his way back to be declared baseball's Comeback King of 1950. That happened at the back of the theatre, where boys always sat. Up front, far left side, was where the older kids gathered on date nights. A big mixed group, guys and girls, would go on Friday nights, and again on Sunday afternoons because the movies had changed. After the show they'd all head up the street for snacks at the Madison Avenue Diner, or get raspberry sundaes at Stittig's ice cream counter. Then the guys would peel away one by one to walk a girl home. 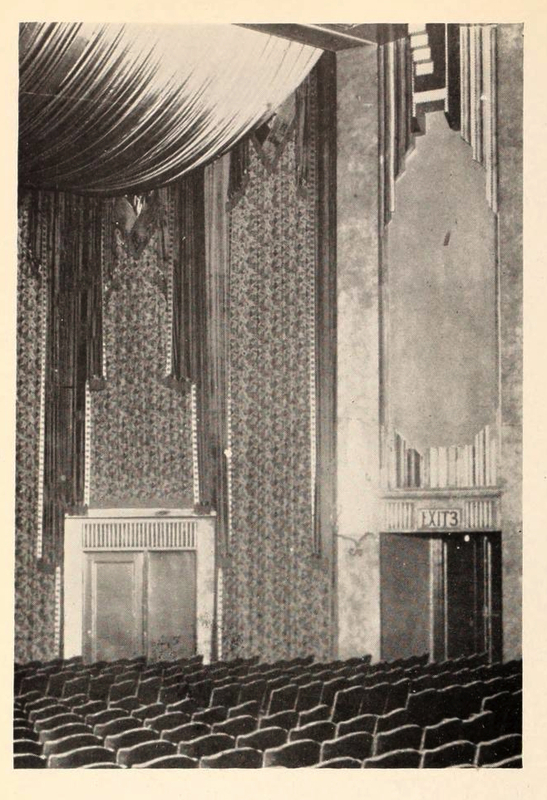 The auditorium, as seen in "Motion Picture News," July 6, 1929. The grand marquee and the Art Deco chandelier are gone now, and so are the Saturday double features. Unable to make it as a single-screen house in an era of multiplexes, the Madison was converted to a five-screen theater in 1995, and later was expanded to seven screens. But the Madison's still a a survivor, offering Pine Hills residents entertainment within walking distance seven nights a week. Have memories of the Madison to share? Send them to history (at) uppermadison.org and we'll post them. Inside the Madison. "Motion Picture News," July 6, 1929.